The Rockers. One of my favorite tag teams of the late 1980s, early 1990s. The Rockers were so exciting to watch, starting from their awesome music that they ran out to the ring with, followed by how they leaped over the top rope simultaneously, their long hair, the bright colored tights, the tassels around their arms, to their in-ring high flying, synchronized wrestling moves. The Rockers, for those who are not familiar with them, consisted of the now Hall of Famer Shawn Michaels and probably the most famous “Other Guy”, Marty Jannetty. Even before Michaels became a break out singles Superstar, he was my favorite member of The Rockers. Most people will be familiar with The Rockers official break up that occurred on the January 12, 1992 episode of The Barbershop. 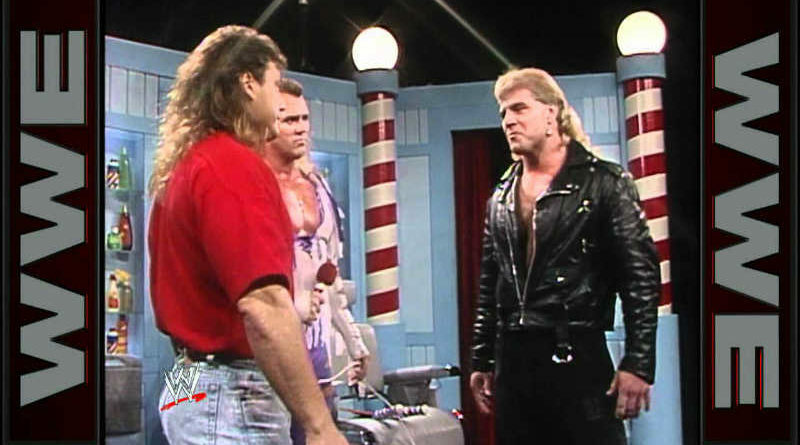 During the interview everyone thought that The Rockers were going to be able to put aside their recent differences and resume teaming up when out of nowhere Shawn Michaels Super Kicked Jannetty. He then proceeded to grab him and throw him through the glass window on the set of The Barbershop. Moments later, Jannetty re-emerged, bleeding profusely. In case you haven’t seen it before or simply would like a refresher, the clip is below. Like most, I thoroughly remember watching this, but does everyone remember the great build up that led to The Rockers ultimate demise? 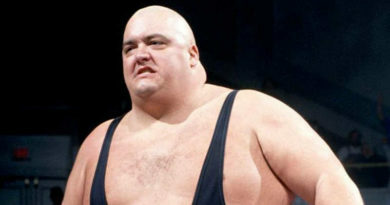 It started on a November 16, 1991 airing of Superstars of Wrestling. On this card, The Rockers defeated the team of Barry Horowitz and Mark Buenavera when Marty Jannetty pinned Barry Horowitz. While this was happening Michaels was not on the ring apron supporting his teammate, he was busy flirting with a girl in the crowd while Jannetty was looking to make a tag. Thus began the dissension within The Rockers. I wonder how many fans at the time knew that in only a few short months The Rockers would longer be a team? A few weeks later at the 1991 edition of Survivor Series the strife between The Rockers would continue to escalate when Jannetty caused Michaels to be eliminated by Brian Knobs after Jannetty slammed the member of The Nasty Boys into him. It was quickly becoming apparent that something was amiss with the team. 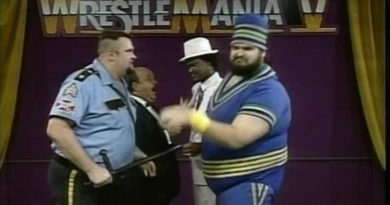 This was followed by a singles match that aired on a December 16th Prime Time Wrestling episode that further intensified the riff between The Rockers. Shawn Michaels wrestled Ric Flair in a singles match in which Flair and Mr Perfect were taking it in turns to injure Michaels outside the ring. Jannetty, watching backstage, had clearly seen enough and came to the ring to, in his mind, rescue his partner from further injury. Jannetty attempted to revive his teammate and put him back into the ring so he would not be counted out. Instead this allowed Ric Flair to cover him for the one-two-three. Looking back on this match, as you can see in the video above, Ric Flair went out of his way to give Shawn Michaels a big push as a singles wrestler. 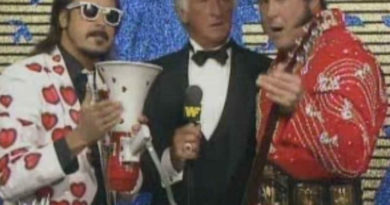 At the time, Flair was involved in many of the main events over the past few months claiming he was the “real” World Champion. He certainly didn’t need to give this young star a chance. Even after illegal outside interference, Flair could have defeated Michaels with his usual finisher, The Figure Four, or even just covered him. Instead, in a classic heel move, Flair had both his feet on the middle rope while the referee counted to three. This of course drew more heat for Flair, but it also gave real credibility to Michaels that he could hang with the big boys as a single competitor. Less than one week later on an episode of Superstars of Wrestling that aired on December 21st, 1991, Shawn Michaels set out to prove to himself (once again) and the rest of the WWE Universe that he didn’t need a teammate when he single handily defeated the team of Barry Hardy and Brian Donahue refusing to tag in his partner. Jannetty left the ring side area while Michaels stayed to pose for his adoring fans. The above match for me is what triggered wanting to write this article, I vividly remember watching this match. At the time I still thought Shawn Michaels was cool before officially turning his back on Jannetty. The final match for The Rockers took place exactly one week later on the last Superstars of 1991 when they faced the tag team champions: Legion of Doom. The Rockers would lose the match after Michaels whipped Jannetty towards Road Warrior Animal who was able to catch Jannetty preparing to slam him. Michaels proceeded to drop kick Animal in the back while Jannetty was still in his arms. Animal landed on top of Jannetty while the referee counted to three. After the match, the two argued while Michaels blamed Jannetty for the loss costing him his opportunity to win his first ever tag team championship. This would be the last televised match The Rockers would have until they reunited over 13 years later.